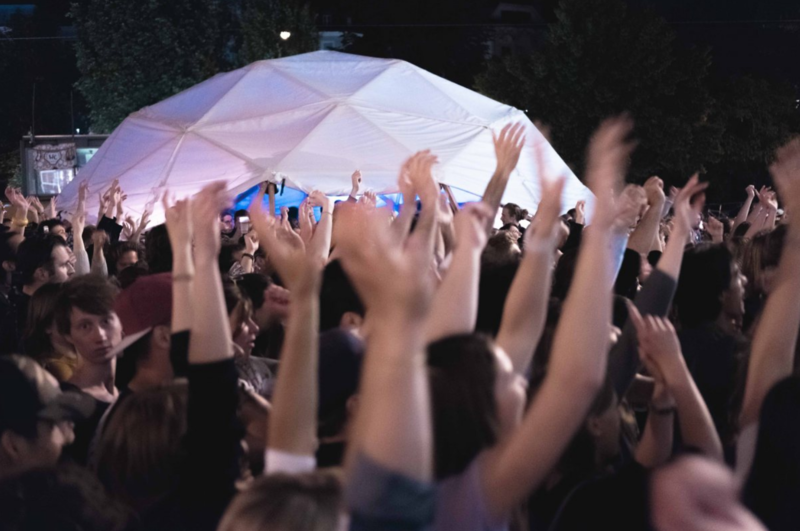 Last week the Lend, a gentrifying working class migrant district in the center of Graz, Austria, was completely transformed when the annual neighborhood network-based festival Lendwirbel took place. Since 2007, Lendwirbel has set goals of enhancing discourse, art in public space, music and neighborhood activities, and this year the focus is on children in streets and public spaces. Actually, Lendwirbel does not consider itself to be a festival, preferring the German “Nachbarschaftsfest”, which although it translates literally to neighborhood fest has a greater focus on the neighborhood than on being a traditional festival. Whatever you call it, the overarching objective is a free, playful, and active creation of the neighborhood. Due to legal reasons an association was formed that constantly resists falling into the hierarchical structures that are suggested by the legal situation. The association views itself as a facilitator between initiatives and participants, hence their ambition to “create concrete options for acting and shaping in order to transform the urban lifeworld for all its inhabitants to a livable and autonomous space” (Lendwirbel Manifesto, 2018). Therefore, they set the framework, the infrastructure, and the legal grounds to encourage various actors to become active during the event week. Streets are blocked, event authorizations are obtained, and the neighborhood transforms into a place where everything seems possible. Although legal constraints are kept, Lendwirbel leaves space for the unexpected. This becomes rather noticeable in the ÖVP-FPÖ governed City of Graz that, in the last years, has launched a number of restrictions concerning events in public space by tightening the so-called Event Law. This has led to great financial costs for initiators and organizers as well as to prohibitions such as drinking in public. Once a year, for seven days, the Lend is transformed into a small heterotopia. You can stroll along with a Walter Benjamin reading circle, hit up the morning disco “Tanzen unter Pflanzen” (dancing under plants), join various discussion groups and expert talks, exhibitions, art installations, a so-called sound dome, take pottery classes, catch concerts, enjoy public living rooms, urban gardening, intercultural story-telling, sport sessions, numerous workshops, and picnics, just to name a few of the activities on hand. One of my personal favorites within the Lendwirbel is Dance Karaoke. It’s a joyful, playful way of appropriating public space on various levels, a participative project that invites people to join; a low-threshold but remarkable impact project. The idea is simple: Videos of people of and in the neighborhood dancing to their favorite songs are projected on public walls where the audience imitates their dance moves. What makes this intervention so interesting is the possibility to participate on various levels: actively, as a part of the production of the dance-movie itself, as a spectator on various occasions, and as a karaoke dancer at the screening. The videos are produced within the Lendwirbel. The Dance Karaoke team moves through the neighborhood for several days, rolling out a rug at different places and inviting passers-by to give a brief dancing performance to a song of their choice. On the last evening a 30 minute long movie of about 50 dancers is presented to an audience of thousands. 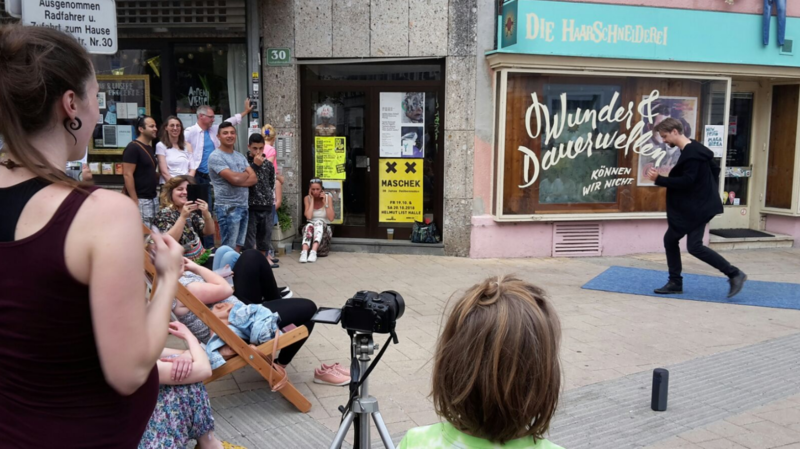 Over the past few years Dance Karaoke has become one of the highlights of the Lendwirbel and even heavy rainfalls and thunderstorm could not prevent the crowd from dancing this year – until the power went out. Although Dance Karaoke does not solve structural inequalities, because of its very triviality dancing can be a fun way to interact, to dismantle barriers and fears of contacts, and to create a short-term community. Text by Rivka Saltiel and Manuel Schöndorfer.